The Tijeras Night Cross race is supposed to be one of the best of the year around here, according to some reliable sources. 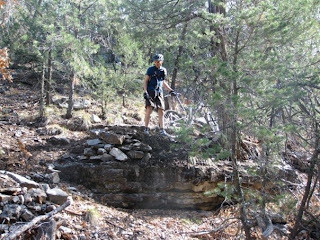 Played hooky yesterday and did a fantastic Otero / Cedro all day Mtb. ride. It was very good times. Except for a few short muddy sections, the trails were dry and generally in fantastic shape. I did manage to get a little too excited at one point, and thoroughly slap myself onto the ground. It appeared as though a smaller rock dislodged under my tire, resulting in the highest speed endo I can ever remember having. Fortunately I landed in-between rocky sections and on relatively soft dirt. Had the wind knocked out of me, seems that I hit my head (sunglasses came off), but only minor scratches really. I think I got lucky. Strangely, I remember thinking shortly before I wrecked “who was it that just told me about wrecking on this trail?….. wow, I’m going fast, I sure am glad Charlie had a helmet to loan me.. WHAM!”. I guess I should have been thinking about where I was going. In the end, I think we did about 25 miles, and it was fantastic. I’ve been hearing there might be some weather rolling in, so there’s a good chance that was my last ride in the east mountains until the spring. So glad we made it out, I definitely didn’t ride out there enough this year. Every time I go ride in the Sandias or in the East Mountains, I get so happy that I live in Albuquerque. We have so many miles of unbelievable singletrack within 20 minutes of the city, it’s just ridiculous (don’t tell anybody, the lack of trail traffic is a blessing too). In shop news, our Roller Sprints electronic hardware and rollers arrived today. Unfortunately, the software that accompanies the electronics we bought is proving to be a little over Danny and my heads, as far as all that is required to get the thing wired up and talking to the computer. You see, my level of computer sophistication has me very comfortable with software that requires you to click one button to download, then a second button to install and run. On occasion there is a little box that must be checked saying you agree to something or rather, and maybe the option to choose “standard” or “custom” installs (always go with “standard”, duh). The sparse instructions quickly left us hanging, and with the distinct impression that whoever wrote the instructions severely overestimated our level of computer-dork speak. We’re gonna get on the phone tomorrow, and hopefully force somebody to walk us through it slowly and painfully one step at a time. And if that works out, we will be up and pedaling our asses off while going nowhere by the end of the day. If it doesn’t work, I will be calling out to all our computer savvy friends and customers to come by and make it go for us. We fix bikes, you fix computers, that’s the way it should be. Once it’s up and running, we plan to set about getting a schedule of venues at which to hold roller racing events. All venues will be place where alcohol is served, hopefully. There has been a lot of excitement from everybody we’ve talked to so far. We’ll keep you posted. Hmmm, it’s 10pm. Is that too late for one more beer?